A former European Ryder Cup star is looking to use Foxhills as a springboard to the Senior Open Championship at St Andrews ahead of the Silversea Senior PGA Professional Championship. Steve Richardson – who represented Europe at the infamous ‘War on the Shore’ Ryder Cup at Kiawah Island in 1991 – will face a rather different atmosphere in the salubrious surroundings of Foxhills Club & Resort as he continues to take his formative steps in senior golf at the tender age of 51. And Richardson, based at Hayling Golf Club in Hampshire, is hopeful Foxhills can be a catalyst towards earning him a place in the Senior Open Championship at St Andrews later this year. Richardson said: “I love playing at Foxhills and I really like the contrast between the two courses. The Longcross is tighter and the Bernard Hunt is a bit more open but you still have to think your way around. “I’m hoping to get through qualifying for the Senior Open, which is on the Old Course at St Andrews this year. If I can put in a good performance at Foxhills, it can give me a bit of confidence going forward and act as a springboard for the season. 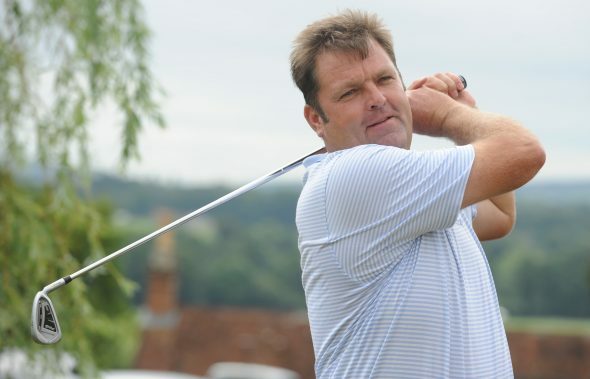 Paul Way – who made his Ryder Cup debut in 1983 and then famously starred for the victorious European team at The Belfry in 1985 – is also on the entry list and is the more experienced campaigner of the pair in the senior ranks at the age of 55. Although both men each have three European Tour victories to their name and both challenged for the Majors during their peak, they face stern competition for the honours over 54 holes at Foxhills’ two courses. The tournament continues its theme with an opening round on the Bernard Hunt course – named after another Ryder Cup veteran – followed by a second round on the Longcross before a final round, for those who make the cut, on the Bernard Hunt course from May 16-18. There is more European Tour pedigree in the ranks in the shape of another winner – Gary Emerson – who lifted the Russian Open in 2004, while there will be a return to Foxhills for the victorious PGA Cup-winning captain, Albert Mackenzie, after he famously steered the GB & Ireland team to success over USA last September at the same venue. But they will need to wary of the twin Scottish threat posed by Bishopbriggs’ Robert Arnott, who took the honours in 2016 and defending champion Fraser Mann of Carnoustie, who also won the event in 2015. As well as the pursuit for prize money, the top-15 will qualify for the Staysure PGA Seniors Championship on the Staysure Tour, which will be staged at the London Club in August. Foxhills director of golf, Chris Fitt, said: “It shows the calibre of this tournament that some of the biggest names in British senior golf are competing. Entry is free for spectators for all three days of the tournament.